The English lexicon is immense. When I write reviews of artists I try to enlarge my discourse in a manner that is not grandiloquent. I hate repetition in adjectives and verbs, and I love experimenting with language. Yes this makes me a word nerd (a werd), but I embrace the title. The reason I begin this new artist profile with a statement on language is because I want to introduce you all to a great word related to the artist I am profiling. It is elysium. You can swap it out with Shangri-la, Zion, Canaan, Utopia, or, simply, Heaven. Let’s say your wandering around this network we like to call the internet and you come across a taste of elysium. Well, damn, you want to share whatever it is like wildfire (or perhaps keep it all to yourself – but I learned early that sharing is caring so here you all go). 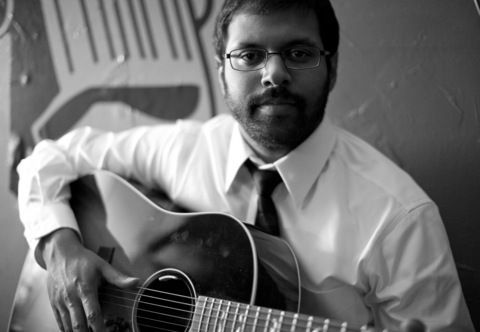 The little taste of music heaven is a Sri-Lankan-American folk/blues artist named Bhi Bhiman. And Mr. Bhiman can do this. Listen to the power. Listen to the vebratto. Listen to the soul. I am not overexaggerating the point. Bhiman takes “Crazy” and literally destroys the song. He picks it apart (similar to how Cee Lo sings it) and destroys its contents to the point that you don’t even hear the lyric anymore, you just hear him. Okay, you are all saying. Sure. He can cover a great song. But this is Cee Lo. What about his original stuff? How does his voice work when you get him to perform some of his own songs? I’ve got some more good news. Bhiman’s solo material is like what would happen if you combined the folky goodness of a David Bromberg/Tim Buckley with the southern soul of Otis Redding and then mixed in some good ol’fashioned early blues. Put all of that in a blender and turn the blender on puree. Ta Dah. Bhi Bhiman. His songs range from a humorous folk originality to sagacious note-shattering fosoblu (folk/soul/blues). Let’s start with the former. Kimchee (kimchi) is a Korean fermented vegetable dish and Bhiman in “Kimchee Line” takes a pretty tradition blues riff and, well, sings about kimchi as if it is a vegetable train (sort of). Included here is the full version of “Guttersnipe,” loaded with the excellent bass of Ben Tudor, moving percussion of Gabe Turow, and effective key-work by Sam Kassirer. The itenerant song features a simple chord progression that helps accentuate Bhiman’s croon. A guttersnipe is a street urchin (which Bhiman pays ode to in the song). The chorus of the song is just Bhiman demonstrating his fantastic chops to the listener. His drop down from his vocal limits back to his comfort zone is so difficult and done to such perfection. At around 4:15 the song darkens and you feel for the poor guttersnipe that Bhiman sings of. You feel the song and that is incredibly important to success. Bhiman is a modern troubador, a true “voice,” and one that you should keep an eye on for this point on. great review! just bought his album and it kills. Guttersnipe is a great tune. I see a bright future for Bhi.